A list of eight ways you can keep your bridal party happy is a valuable tool for any wedding couple. It's important to remember the bridal party takes on many roles, duties and expenses during your wedding. Eight simple tips help you to keep relationships strong during this exciting but hectic time. Following well-thought-out ways to keep everyone content makes managing such a complex event easier. Helpful tips are reassuring even to you on your big day! Before asking your bridal party to do anything, think about your own experiences in a bridal party. Did you resent being told to help with invitations? Were you left out of a fun wedding dress shopping trip? Did the groom neglect his ushers, which included you? Remembering how you felt as a member of other people's bridal parties helps you be more considerate of your own bridal party. Let your bridal party members know exactly what you expect of them. For example, do you expect everyone to pitch in with decorating before the ceremony? Do you want the bridesmaids to have the same shoes? Letting everyone know what you expect is important so that there are no misunderstandings. Consider writing out a wedding planning checklist for bridesmaids and groomsmen with various events and information they need to know. Remember that you might need to add information to the maid of honor checklist or give the best man a guide to his own duties, since both roles have a special place of importance in the wedding party. Planning ahead goes hand in hand with communicating bridal party duties. You cannot expect the bridal party to be available for events or willing to help out if you do not plan ahead. For example, if you want to plan a choreographed surprise wedding dance that includes the wedding party, give them plenty of notice for setting up lessons. Asking someone to stand up with you in front of your guests means that the bridal party members hold a special place in your lives. Honor this special place by asking for advice and input into the wedding planning decisions that relate to them. Bridesmaids might dislike low-cut gowns, while groomsmen might be able to recommend a great limousine rental. Just because you ask for advice does not mean you are obligated to follow it. However, bridal party members will appreciate being able to express their opinion openly and honestly. These costs can add up quickly for bridal party members. Do your best to keep costs down, such as finding discount tuxedo rentals or recommending nice but cheap hotels. If you are planning a luxury wedding, do not expect your bridal party to plan an expensive shower or bachelor party, too. One of the most important tips out of the 8 ways to keep your bridal party happy list is to be appreciative. Simple manners, such as saying please and thank you, go a long way. Politeness matters to your wedding party members, especially when asking your friends and family to do so much for a day that is all about you. Even if you plan to give wedding party gifts, make sure you take a few moments and let your attendants know how much they mean to you. It can be easy to get caught up in a wedding planning frenzy. While it is necessary to speak with your friends and relatives about wedding details, remember that the wedding is not the only thing going on in the world. Be sure to ask your bridal party members about their own families, jobs and lives. Schedule a few get-togethers that have nothing to do with the wedding in order to stay grounded. A wonderful wedding planning tip in general, and especially for keeping your bridal party happy, is to stay calm. Wedding oops and mishaps are bound to happen. Staying calm in a time of crisis, whether minor or major, is imperative if you want to avoid becoming a naughty bridezilla or groom. Staying calm also helps solve vendor snafus and other crisis without going crazy. 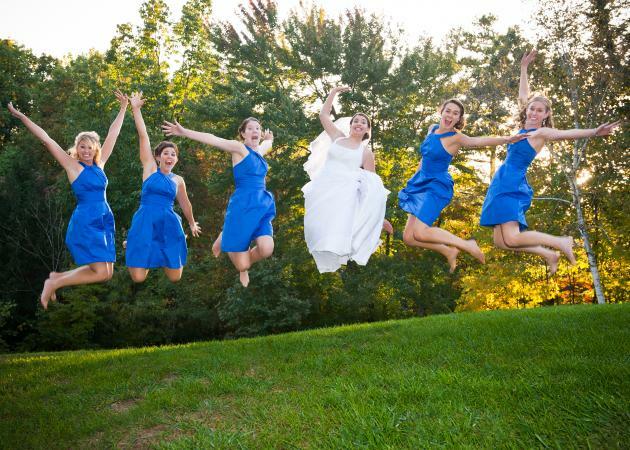 Busy brides and grooms should make time to make sure their bridal party is happy. After all, these people are close friends and family who have agreed to stand up for you on the most important day of your lives, so make the extra effort to show them how much you appreciate them.